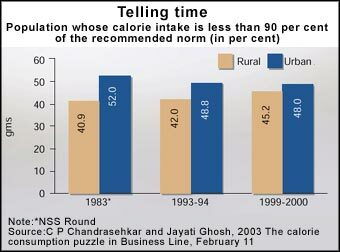 Economists C P Chandrasekhar and Jayati Ghosh call this phenomenon the "calorie consumption puzzle". Delving into the data released by the National Sample Survey Organisation (NSS) on nutritional intake in India -- data pertaining to the 55th round of survey for 1999-2000 -- they conclude that the report reveals unmistakable proof of a decline, over time, in per capita calorie consumption on average. The decline is "especially marked" in rural India. "Average calorie consumption in India," they write, "was already low by international standards. That it has actually declined despite apparently high aggregate economic growth rates is clearly something that merits much more attention". In short, something is terribly nutritionally deficient in the Indian state. Exactly how appalling..? 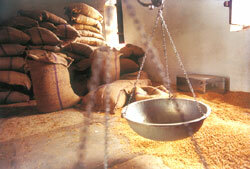 • Cereals and millets (in Gujarat, Karnataka and Maharashtra) formed the bulk of the diet. Between 1975-1979 and 1996-1997, there has been a decrease in consumption. • Consumption of foodstuffs such as pulses were less than the recommended dietary intake (RDI) -- 40 gm per day -- in all states except Karnataka. The deficiency ranged from 15 per cent of RDI in Gujarat to 57 per cent in Kerala: this also reflects local changes in diet. • Green leafy vegetables formed only 17-27 per cent of RDI (40 gm) in different states, the average being an abysmal 15 gm per day. The deficit in the intake of other vegetables (such as gourd, beans, brinjal, cauliflower) was 12 per cent of RDI (60 gm) in Gujarat to around 53 per cent in Andhra Pradesh and Karnataka. Over time, the increase in intake of green leafy vegetables was a mere 8 gm per day in 1975-1979 to 15 gm per day in 1996-1997. The consumption of other vegetables shows a decline: 54 gm per day in 1975-1979 to 47 gm per day in 1996-1997. Thus it is not surprising that in terms of nutritional intake, the figures for rural India that NNMB throws up are seriously troubling. On an average 70 per cent of households consumed protein less than RDA (recommended daily allowance, 60 gm) for all states. Similarly, energy intake was less in 75 per cent of all households surveyed. Inadequacy also marked the consumption of micronutrients such as iron and calcium. "The land holding status [in rural India] over the past 20 years indicates fragmentation of land holding size, indirectly leading to food insecurity. An appraisal of the changes in some of the socio-economic factors indicates that, by and large, the improvement was only marginal. In fact, the proportion of landless seems to have increased in the sample studied. This, perhaps, explains as to reasons for no changes in the dietary pattern in the States surveyed during the past 2 decades". Clearly, India is eating less. People are increasingly becoming poor and marginalised, which directly tells upon their their food intake and so the nutrition their bodies receive, But, even worse, what India is eating is also bad. Its nutrtional deficiency understands neither poverty nor wealth; the deficiency affects all. Also discussed were methods of litigation, guerrilla tactics such as several types of unexpected lawsuit filings and pushing the envelop with cases that appear 'frivolous' to get bigger results and larger settlements. Speakers included Marion Nestle, professor of nutrition at New York University and author of Food Politics, a book which indicts the food industry for the pressure tactics they use. "[Obesity] is a tremendous driver of ill-health for Americans, young and old," said conference organiser and well-known anti-tobacco crusader Richard Draynard. Encouraging lawyers to commit to suing fatty-food makers and restaurants for millions, George Banzhaf, professor of law at George Washington University, said: "Remember, many social movements were kick-started by litigation". A day before the conference, Banzhaf -- who led the charge against tobacco companies -- deposed in front of a House judiciary subcommittee, which in the process of hearing testimony on H R 339, "The Personal Responsibility in Food Consumption Act". The proposed legislation was introduced in Congress on January 27, 2003 by Republican senator Ric Keller; it is aimed at putting "common sense in a food court, not blaming people in a legal court wherever there is an excessive consumption of fast food". Critics suggest it is aimed at protecting restaurants from obesity-related lawsuits. The possibility of a new wave of tobacco-style lawsuits has provoked outrage in the food industry, who must be looking to Congress for relief. Currently, 61 per cent of adults in the US and 13 per cent of children are either overweight or obese.  A shift in diet towards high-fat, refined carbohydrates and low-fibres. The diet becomes more energy-dense: people get most of the calories their bodies require from fewer foods. The diet becomes rich in fat, especially saturated fat, and sugar, but deficient in complex carbohydrate foods that are the main source of dietary fibre. The dietary transition is inseparable from the insertion of countries into the circuits of global trade in food. The global value of trading in food increased from US $224 billion in 1972 to US $438 billion in 1998; food now constitutes 11 per cent of global trade. This increase has been accompanied by the consolidation of agricultural and food companies into large transnational corporations. Apart from globally sourcing supplies, centralising strategic assets, resources and decision-making, these corporations penetrate new markets by purchasing large and often majority shares into local food producers, wholesalers or retailers. This process has now been canonised into law: World Trade Organization agreements place great pressure on developing countries to 'structurally adjust' markets. Let us now consider the larger terrain in which the results of the surveys must be understood. It is clear that from the mid-1970s onwards, nutrition -- the nourishment of the human body -- has become an increasingly absent factor in the development process in India, both in terms of how the process was envisioned or planned for and how it actually unfolded over time. The balance whereby the ecology of the human body renders itself sustainable has, over time, degraded. It has degraded to the point that today the country faces a double burden. Even as rural India struggles unsuccessfully to shrug off an older legacy of undernourishment, urban India -- firmly a in the lap of a globalised diet consisting of fats and sugar -- tries to come to terms with overnourishment, and the ill-health that too much of bad food has begun to lead to. Both are forms of malnourishment; that they co-exist today points to a failure so systematic that the question must be asked: surely the Indian state could not have intended its people to be so burdened? Credit must be given where it is due. There is no doubt that the goal of attaining adequacy in food production -- the cornerstone of India's food policy since Independence, and manifested in the green revolution -- ensured that by the early 1970s India was no longer burdened by famine. PEM, or protein energy malnutrition -- in its two most common forms, marasmus and kwashikor -- among preschool children was endemic to this country 50 years ago; today it has been controlled. The NNMB survey reveals that in terms of weight for age, the proportion of severely malnourished children -- another legacy of the colonial policy of using the best cultivable lands to grow commercial crops such as cotton, jute, oilseeds and opium for export -- reduced from 15 per cent in 1975-1979 to 8.9 per cent in 1996-1997. Of course there has been progress. The green revolution ensured that by 1980 India had become self-sufficient in foodgrains. By this time, however, it had irrevocably transformed the linkages of food, technology, ecology and culture within which people lived their lives. Its exclusive focus on a cropping pattern hell-bent on growing wheat and rice; its creation of input-intense agriculture that by the mid-1970s ushered in rapid commercialisation; and its focussed ignorance of pulses, coarse grains, fruits and vegetables led to skews whose perverse nutritive outcome is still mirrored in the surveys. Consider one: the existence of the lowest rural average nutrient intake, in the nss survey, in relatively high per capita income states such as Gujarat, Maharashtra and Andhra Pradesh. The low intake is related to a fall in the consumption of cereals in rural areas in these major states. While local cultural preferences could be a reason for this fall, it is also a fact that, among major states, these have the lowest per capita production of cereals. In other words, foodgrain has to be brought in, thus increasing its prices and keeping it out of the reach of people. Clearly, people in these states are suffering from the effects not only of price movements of food, but also compromised local food security. Indeed by 1980, even as national food security came within the grasp of the Indian state, it slipped out and away in the form of local and regional nutritive insecurities, especially among the poor. The 1980s and 1990s were a time of rapid changes in agricultural planning. Even as the green revolution exhausted itself, leading to stagnating rates of growth in foodgrain yields, the government began to promote the industrialisation of agriculture. Farmers were asked to diversify into cash crops and produce crops that were suitable for export: tomatoes in place of wheat, flowers in place of rice, or durum wheat (used to make bread). The so-called liberalisation of the Indian economy in 1991 was both a catalyst to the process, and a booster. It ensured the canonisation of agribusiness (see graph: booming agribusiness in India). It ensured that the small and marginal farmer could now be ignored without guilt. Latching on to increased incomes and new aspirations among a rapidly growing urban middle class, it used the promise of cheap and healthy food available off the shelves of superstores to sound the death-knell of a nutritively balanced body. If it is the avowed objective of food policy to ensure adequate supply of food to people, then in the last two decades, the continued reduction of the definition of food to 'foodgrain' and consequent lack of focus on wholesome diet provision has meant -- among other things -- that pulses, vegetables or even fish have remained consistently unaffordable for the greater part of the Indian population. If it is the avowed objective of food policy to ensure a minimum supply of foodgrains to consumers at affordable prices, then in the last two decades, the public distribution system (PDS) -- set up primarily to tackle large-scale nutritional deficiency -- has become such a shambles that it can no longer be considered a viable instrument that can take care of even the minimum nutritive needs of people. Nothing illustrates this tendency better than the targeted public distribution system, introduced in 1997. Neither has it reduced the government's subsidy bill, nor has it provided support to the poor. The reasons lie in the exclusion of a large number of deserving families from the below poverty line category; the inability to check corruption in the face of significant gap between the above poverty line and below poverty line prices. But above all, the policy insistence on maintaining that the basic rationale for PDS consists of preventing acute hunger and malnutrition has completely divorced this instrument from the reality of the changes in the lives of the very people it purports to target. PDS has nothing to say, and cannot do anything, to tackle the insidious long-term undernutrition the surveys are a proof of.  Among children in urban regions of district Dharwad in Karnataka showed that the prevalence of obesity in children aged 12-17 was 5.8 per cent. A similar one, carried out in the public schools of Meerut city, Uttar Pradesh, showed that in children aged 10-19, the prevalence of obesity was 8.4 per cent. We are not eating well. It is showing.